LB 107: Reducing unnecessary regulations through the elimination of the Integrated Practice Agreement for Nurse Practitioners to practice in the state. LB 109: Recruiting and retaining veterans’ families byupdating state policy to provide in-state tuition to veterans and spouses who move to Nebraska. LB 146: Honoring veterans by establishing a process for veteran service organizations to inter unclaimed veteran remains. LB 149: Improving procedures for SID elections. LB 150: Clarifying situations where the LB 840 economic development tool can be used. LB 151: Allowing cities to address vacant properties more promptly. LB 219: Protecting military children during deployment through the Uniform Deployed Parents Visitation and Custody Act. LB 266: Clarifying Municipal Nuisance Ordinance Authority. LB 272: Helping veterans integrate into our workforce with a private sector hiring preference option for businesses in Nebraska. LB 390: Providing treatment for children with seizures who have not responded to other traditional treatments. LB 541: Increasing transparency by adding record retention to the Taxpayer Transparency Act. Another one of my bills, LB 459, currently sits on General File and will carry over into next session. This bill provides protections for child victims and witnesses in criminal cases who have been interviewed on tape by child advocate experts. The bill requires a higher standard for allowing pre-trial investigatory depositions and establishes a framework for protective measures for the children when such a deposition is necessary. Part of our work this summer will be visiting with senators to continue to build support and garner support for the bill. Several more of the bills I introduced are still in their respective committees, including LB 166. LB 166 brings additional transparency and accountability to campaign funds in Nebraska. Current law does not provide a second check against fraud using campaign funds. There have been several high profile cases over the past decade in which campaign funds were misused for gambling, tattoos and dating services which were only discovered through other investigations. Nebraska’s Accountability and Disclosure Commission serves as Nebraska’s election and campaign watchdog. However, they lack the tools to protect donors from potential abuse of campaign funds. LB 166 provides an important tool to ensure campaign funds are represented truthfully and used as reported by candidates. I will continue to push for campaign finance reform next year either through LB 166 or a new bill. This month I launched a new feature on social media: This Week in the Interim. 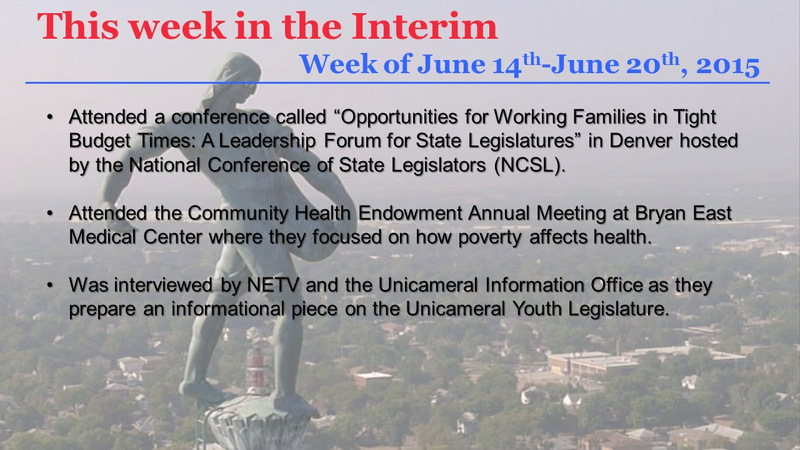 These once a week posts, typically shared on Fridays, highlight some of the meetings and activities in our office from the previous week and offer a behind-the-scenes look at what goes on when the Legislature is not in session. Already I’ve attended the Midwest Higher Education Commission Annual Executive Committee meeting as one of the two Nebraska delegates, learned more about issues in telehealth at a National Conference of State Legislatures workshop, participated in a patient-centered medical home discussion with key policy makers, physicians and insurance providers, and held an end of session workshop with my staff to review this past session and plan for the next year. To see these weekly posts, be sure to like my Facebook page or follow me on Twitter (@SenCrawford). On Wednesday, I had the opportunity to write this week’s Platte Chat, a weekly column published by the Platte Institute for Economic Research. My piece highlights several levers available to citizens to challenge burdensome regulations, including a citizen review process for regulations. This citizen-driven review is the result of LB 719, a bill I introduced and the Legislature passed in the 2014 session. LB 719 provides a mechanism to push for reconsideration and revision of regulations that have become out of date, redundant, or more costly than expected. To read more about the 719 process and other ways citizens can combat burdensome regulations, visit HERE. Join me at the Bellevue Farmer’s Market This Summer! 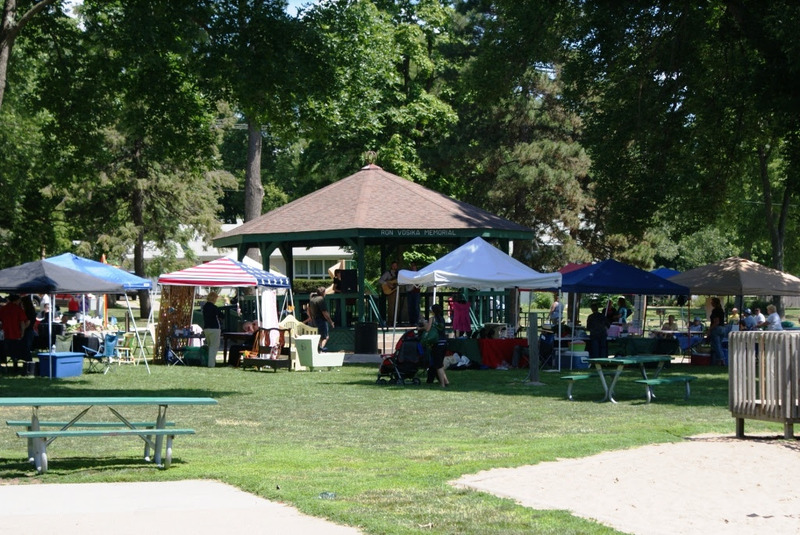 Each Saturday morning from now until October 3rd, vendors will set up in Washington Park for the Bellevue Farmer’s Market. This offers a great chance to purchase fresh produce, baked goods and crafts from local artisans. I will set up a table at the Farmer’s Market once a month over the summer. I will be there on the fourthSaturday of June (6/27) and July (7/25) and after the Arrows to Aerospace parade (8/15) to answer questions about last session and to take suggestions about future legislation. I hope to see many of you this summer at one of these three events!